I’d like to think I’ve lived a good, honest life. I pay my taxes. I vote. I work hard and provide for my family. But there’s one thing I know I’m not proud of. One thing I know I’ll regret until the day I die. I was onstage at the Grammys during that “Soy Bomb” thing and I did nothing. It all happened so fast. 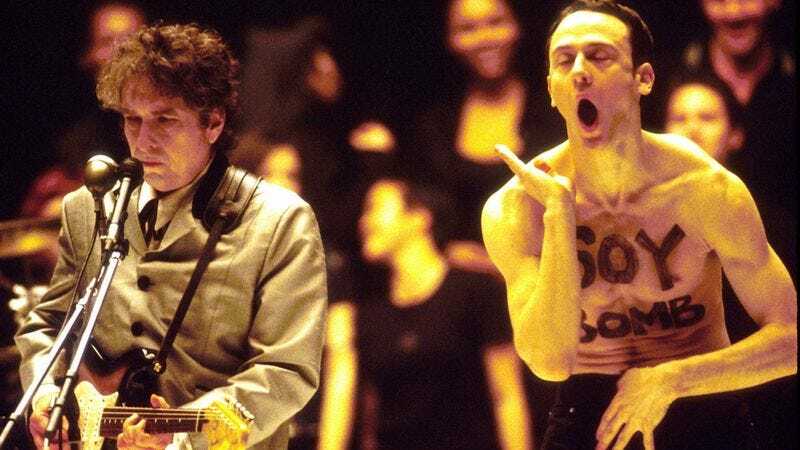 One second, we were dancing in the background as Bob Dylan performed “Love Sick” at the 1998 Grammys, and the next thing I knew, some guy had run to the front of the stage with the words “Soy Bomb” written on his chest and started doing a very bizarre dance. I knew he wasn’t supposed to be there. Hell, we all knew. But did I do anything to stop it? No. I just stood there and swayed along to the song like an idiot. Like a coward. The worst part is knowing that I could’ve done something. I could’ve tried to talk the “Soy Bomb” guy out of it right there on stage. Pleaded with him to stop doing that crazy dance in the middle of Bob Dylan’s song. Maybe I could have just tackled the “Soy Bomb” guy. I could’ve done anything. Anything other than what I did, which was nothing. This all goes without mentioning the victim of the whole incident: Bob Dylan. Poor Bob. He didn’t ask for his song to be interrupted by what was later revealed to have been a performance art piece. He especially didn’t deserve to be abandoned in that moment by the background swayers who were supposed to be there to support him, but just stood by during his time of need casually grooving along to his song. I just stood there and swayed along to the song like an idiot. Like a coward. The guilt stays with you. Sometimes I won’t be able to sleep, and I’ll find myself watching the footage over and over again, all through the night. I think maybe, if I watch it enough, it’ll change what happened. I’ll be the guy who rescued Bob Dylan from those terrible 32 seconds when a shirtless man with the words “Soy Bomb” written on his chest danced near him during his performance at the 40th Annual Grammy Awards. Clearly, Bob Dylan and the rest of America needed me that night and I let everyone down. I’ll never forgive myself for it.